At Hospice of the Red River Valley, we’re fortunate to have many dedicated volunteers. The Volunteer Spotlight celebrates their contributions to the organization and the ways they enrich our patients’ lives. 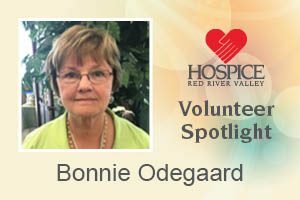 Why do you volunteer with Hospice of the Red River Valley? I had been into Heirlooms Thrift & Gift as a shopper, and it was a pleasant experience. I asked another volunteer how you become a volunteer, and that’s how I started. I enjoy driving into town from Kindred to volunteer once a week. Nothing compares to Heirlooms Thrift & Gift, and it’s because of the beautiful donations that people bring in. What is your favorite volunteer memory? I like interacting with customers, and meeting and getting to know the other volunteers. Many times store patrons share their Hospice of the Red River Valley story, and I listen to them. I enjoy this store, and I am proud to work here. What are two personal habits that serve you well? Reading historical and fiction books, and sewing. I am a quilter, and I make quilts for my family but mostly for charity. I am a member of a quilting club in Arizona.